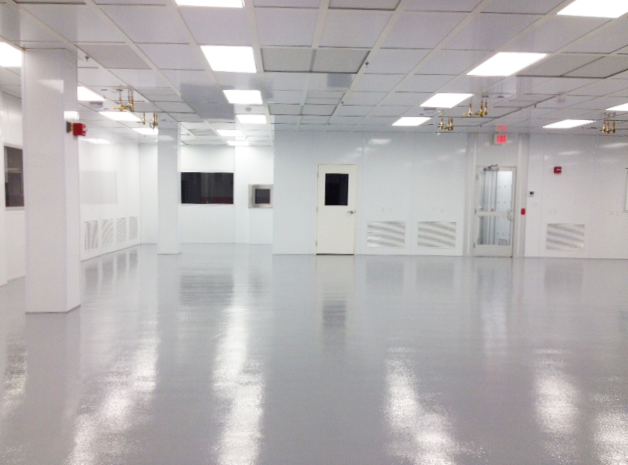 HCC created the cleanroom envelope in an existing plant, with insulated metal panel exterior walls and plenum cap, as well as Power-T ceiling grid to make it a walkable system. The plenum support system, ceiling grid, and ceiling tiles, were all able to support a man load so service could be performed above the ceiling. HCC installed new epoxy floors, HVAC controls, electrical, process piping, an air shower, and pass-thru. HCC provided a new dedicated make-up air system to control pressure and humidity, with a new humidifier fed from a new dedicated RO water system. A new sensible cooling recirculation unit was installed to cool the process load. The unit did 75% of the rooms recirculation air and was supplemented with 4×4 fan filter units, with ECM motors.